Energy Dispersive Spectroscopy (EDS) instrument manufacturers and research labs are continually pressing for x-ray components that enable higher performance at a lower cost. 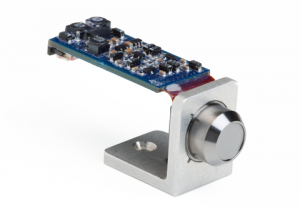 High performing x-ray detectors are critical to building quality instruments. Moxtek® has improved the sensitivity of our Si-PIN detectors by using thicker diodes and thinner beryllium windows. The increased performance enables faster sample times, improved sensitivity, and expanded range of photon detection. 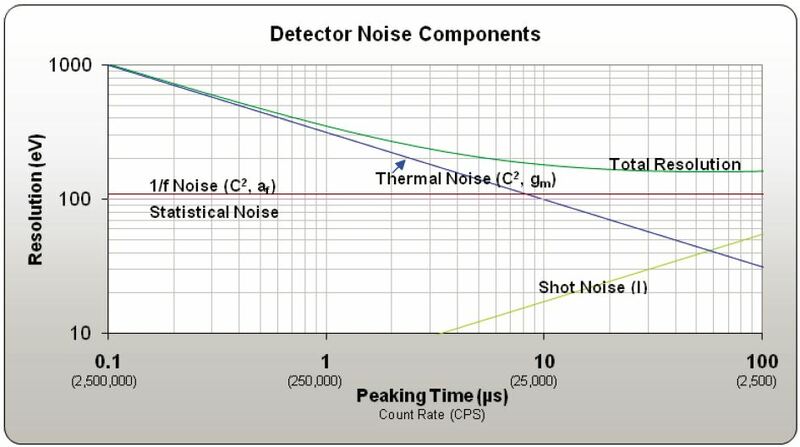 At short peaking times, where the shot noise has very little impact on the resolution, the two dominant noise sources—thermal and 1/f—depend very strongly on the total capacitance between the anode and any grounded or DC-biased conductors (see Figure 1). 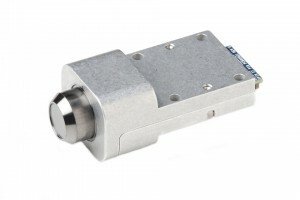 Therefore, reducing that capacitance has an enormous impact on the detector resolution. One way to reduce the capacitance of a PIN diode detector is by making the diode thicker. 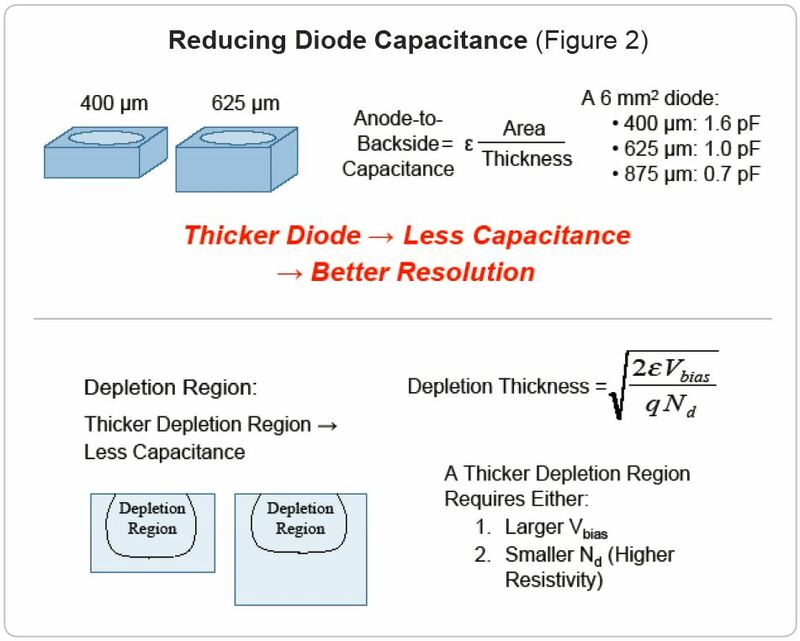 For example, a 400-μm diode has an anode-to-backside capacitance of 1.6 pF, whereas a comparable 625-μm fully-depleted diode has a capacitance of only 1.0 pF (see Figure 2). 1. 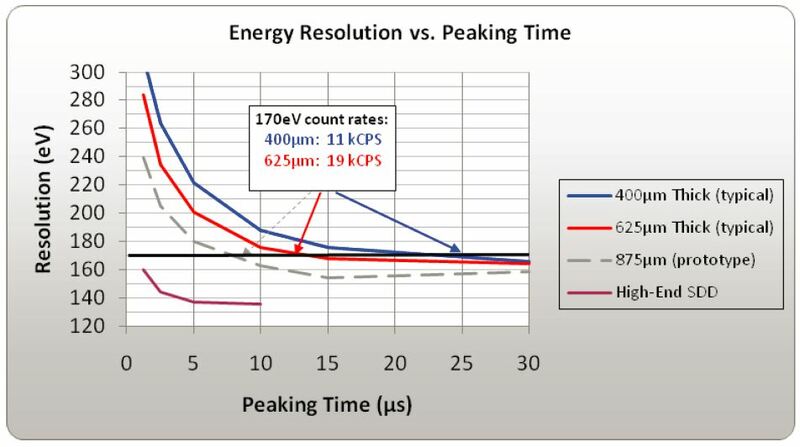 Full depletion requires either a higher voltage bias or silicon material with a higher resistivity. 2. Diodes with thicker depletion regions have larger volumes and therefore higher leakage currents, so using a diode manufacturing process that results in very low leakage currents is essential. 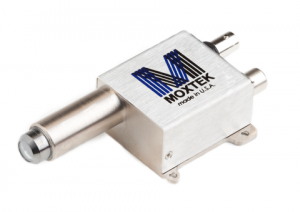 Moxtek has developed Si-PIN detectors with 625μm and 875μm diodes (875μm device is currently in research and development stages) which have lower capacitance resulting in better energy resolutions than the 400μm devices, especially at short peaking times which make higher count rates possible. The thicker devices offer performance advantages that begin to approach SDDs but at a much lower price (See Figure 3). 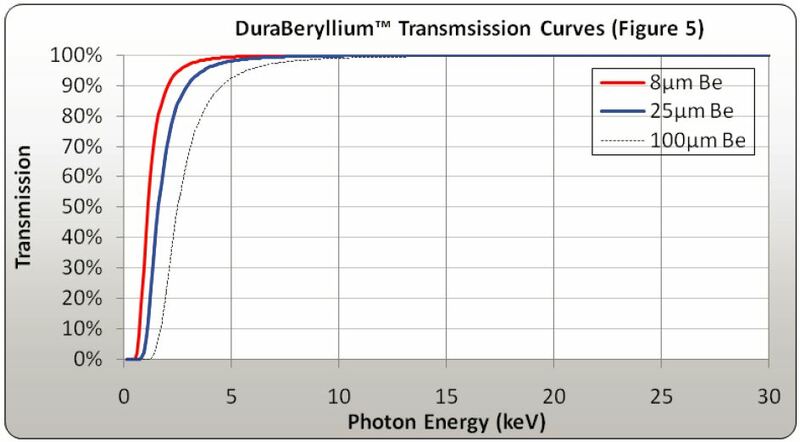 Another advantage of thicker Si-PIN diodes is greater energy absorption at the higher energies which is important for heavy elemental analysis. Figure 4 shows the absorption curves of three different diodes thickness. 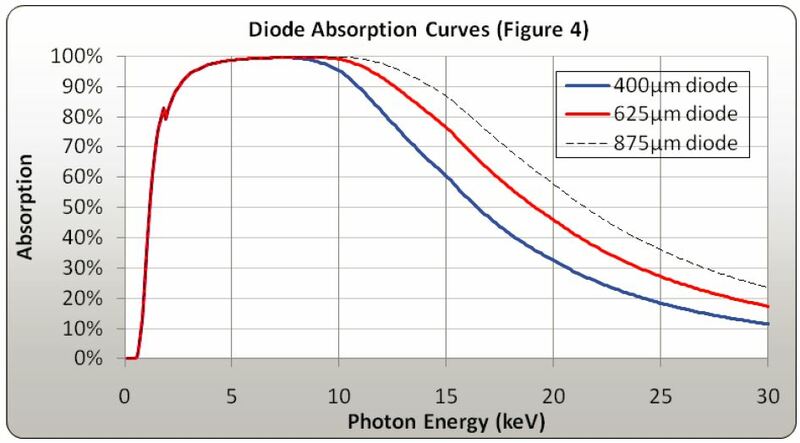 Note that at energies above 25 keV, the 625μm device has about 50% greater absorption efficiency than the 400μm device. The XPIN™ is Moxtek’s next generation Energy Dispersive X-ray Fluorescence detector (EDXRF). 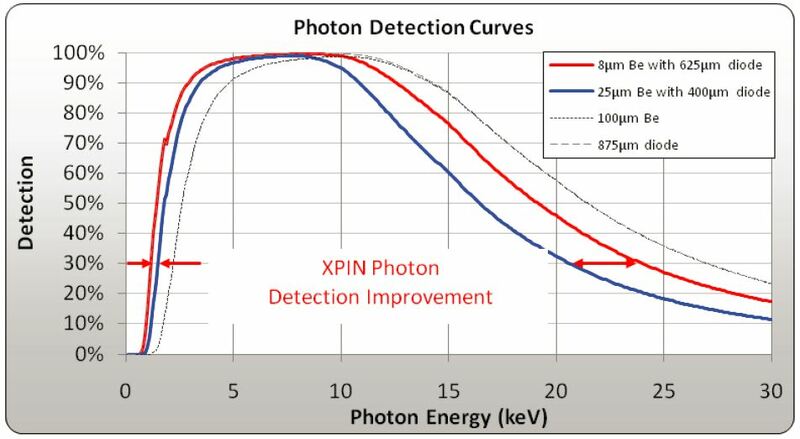 The XPIN takes advantage of thicker Si-PIN diode material as well as thin beryllium windows providing optimal energy resolutions and x-ray photon sensitivity. The XPIN comes in multiple configurations for design flexibility for a variety of industrial EDXRF applications.